Whether it is a short amble or a day-long trek, the park offers walking and hiking opportunities for all ages and abilities. In fact, Woodstock is a town that celebrates walking. 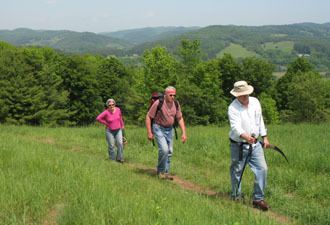 The Woodstock Trails Partnership offers year-round recreational opportunities and events on the 30 miles of carriage roads and trails that connect the park, town, and many scenic lands around Woodstock. Forest Festival, held during the last weekend of September, is a celebration of the art, ecology, and history of Vermont’s forests. Visitors can take a hike with an ecologist or forester, see wood sawing demonstrations, make children’s crafts from local wood, and visit with woodworking artists. 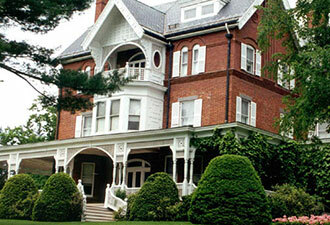 The mansion and gardens are open for guided tours from Memorial Day weekend (late May) to October 31. This is a park about an idea that has shaped the landscape of this country, that continues to touch each of our lives, and that offers hope for the future. This is a park about stewardship – about people taking care of places. Located in the rolling hills near Woodstock, Vermont, Marsh-Billings-Rockefeller National Historical Park is the only national park to focus on conservation history and the evolving nature of stewardship in America. The park is the historic home of three families who cared deeply for the world around them and who recognized the diverse and intricate connections that bind us to the health, beauty and character of the land. The park is named for three families. George Perkins Marsh was one of the nation’s first global environmental thinkers and grew up on the property. Frederick Billings was a conservationist who established a progressive dairy farm and professionally managed forest areas of the former Marsh farm. Frederick Billings’s granddaughter, Mary French Rockefeller, and her husband, conservationist Laurance S. Rockefeller, sustained Billings’s mindful practices in forestry and farming over the latter half of the 20th century. Today, the park interprets the history of conservation and demonstrates sustainable management practices in the stewardship of the Marsh-Billings-Rockefeller mansion and grounds and the surrounding 550-acre forest. The mansion contains an extensive art collection of American landscape paintings by such renowned artists as Thomas Cole, Albert Bierstadt, and Asher B. Durand. The collection illustrates the influence of artists on the developing conservation movement in the 1800s and changing popular perceptions of the environment. 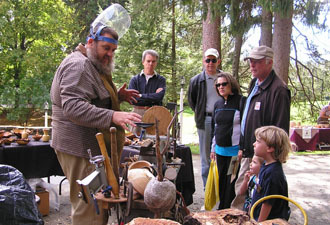 Each fall, the park hosts an artist-in-residence. Whether the artist is a weaver, painter or photographer, that person continues a tradition to explore the human relationship with the landscape. You can join the artist in the studio, see the work first-hand, and hear his or her stories. After you finish your tour, take a stroll through the landscape that shaped the conservation thinking of these three families and many others who have walked these hills. The Mount Tom Forest has been actively managed for more than a century, making it one of the oldest planned and continuously managed woodlands in America. It is a landscape of loss and recovery, of beauty and utility—a living exhibit of the evolution of forestry in the United States from the turn of the century to the present. The picturesque carriage roads, designed by Billings in the late 1800’s to encourage the public to enjoy and learn about the forest, continue to offer visitors opportunity for inspiration, reflection and relaxation. The roads wind past stately sugar maples and 400-year-old hemlocks, through lush hardwood forest and ascend to breath-taking overlooks above the countryside.